These are photographs of the Greenwood Hotel in Eureka, Kansas. In October of 1883, the Greenwood Hotel was completed with 43 boarding rooms and 50 beds. 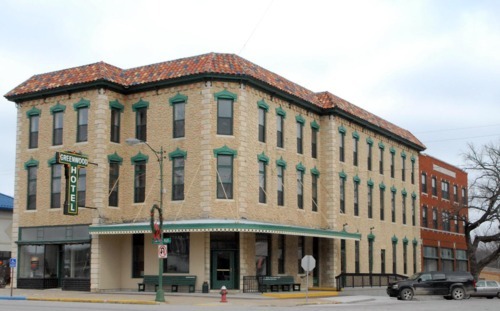 Built by The Eureka Hotel Company, a stock company consisting of prominent early settlers of the Eureka community the total cost of construction was $23,000. The hotel was originally called "Hotel Greenwood" in honor of the county in which the hotel resides as well as the namesake of the county, Alfred B. Greenwood. After falling into disrepair, renovation on the Greenwood Hotel began on March 8, 2010. It reopened to the public June 13-18, 2011.